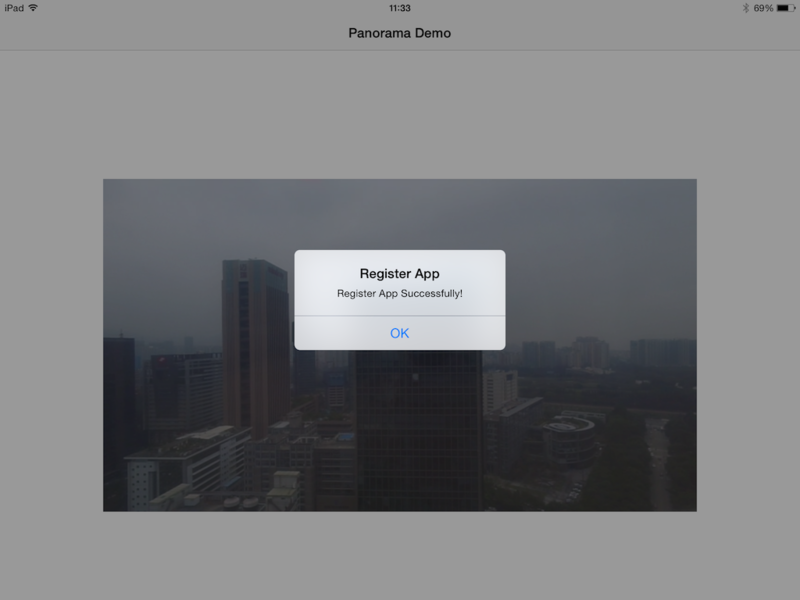 In this tutorial, you will learn how to build a cool panorama app. With the help of the powerful DJI Mobile SDK and OpenCV libraries, it is actually easy. You will use the Waypoint feature of Intelligent Navigation and Virtual Stick to rotate the aircraft to take photos. The panorama application can be broken down into several simple tasks, all you need to do is to follow the tutorial step by step. Let's get started! 1. Now, let's create a new project in Xcode, choose Single View Application template for your project and press "Next", then enter "PanoDemo" in the Product Name field and keep the other default settings. Once the project is created, let's import the DJISDK.framework to the project. If you are not familiar with the process of importing DJI SDK using Cocoapods, please check this tutorial: Importing and Activating DJI SDK in Xcode Project For importing the DJIWidget to the project, you can check our previous tutorial Creating a Camera Application to learn how to download and import the DJIWidget into your Xcode project. //Please enter the App Key in the info.plist file to register the App. 5. Build and run the project on your mobile device, then connect your device to the aircraft. Now you can see view the camera's video stream on your device. In order to generate a panorama, you need to take a series of photos from different angles while keeping the center of the drone still. This is easy to do with the gimbal on Inspire 1, but with the Phantom 4 you cannot control the gimbal's yaw angle using our SDK. Instead we will rotate the entire drone. Here's the instruction. 1. 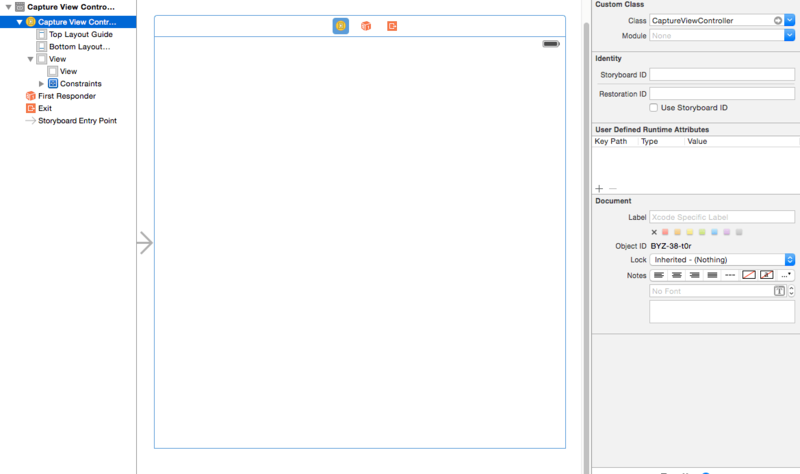 Add a Capture button in Capture View Controller in Main.storyboard. Name its IBOutlet as captureBtn respectively, and its IBAction as -(IBAction)onCaptureButtonClicked:(id)sender. As the code shown above, we configure the flightController's delegate, and yawControlMode properties. Then invoke the setVirtualStickModeEnabled:withCompletion: method to prepare for the virtual stick control. 4. Now try to build and run the app, connect your mobile device to the remote controller, switch the flight mode to F (Function) mode, take off the drone and press the Capture button. You should see the drone rotates in 360 degrees, 45 degrees each time. If you are not familiar with the DJI Assistant 2 Simulator, please check the DJI Assistant 2 Simulator Tutorial. We create the rotateDroneWithJoystick and setCameraModeToShootPhoto methods to make sure the current work mode of the camera is DJICameraModeShootPhoto in case it's set to other values before we start the 360 degrees panorama shoot photo action using virtual stick. Also, in the rotateDroneWithJoystick method, we firstly check if the current DJI Product is DJI Spark, if so, we invoke the setGestureModeEnabled:withCompletion: method of DJIActiveTrackMissionOperator to disable gesture mode since DJI Spark will enable it by default and the virtual stick control may not be available under gesture mode. Then we refactor the productConnected: delegate method and create the enableVirtualStick method to configure the yawControlMode, rollPitchCoordinateSystem properties and enable the virtual stick mode of DJIFlightController. Create the executeVirtualStickControl method and dispatch a new asynchronous thread to execute it in the completion block of setVirtualStickModeEnabled:withCompletion: method. In the executeVirtualStickControl method, we use sleep(2) to sleep for 2 seconds between rotating the drone and shooting photo actions here to ensure each action is executed ordered(Shoot photo action may take around 2 seconds to finish). When the for loop finished, we disable the virtual stick mode and show an alert view in the main thread to notify the user "Capture finished". If you have an Inspire 1, you will benefit from being able to shoot photos without moving the drone, taking advantage of the gimbal's 360 rotation capabilities. Rotating the gimbal while keeping the drone still in the air means you will have a stable photography platform, which helps you to create a wonderful panorama. Let's take a look at the implementation. Set the DJICamera's cameraMode to DJICameraModeShootPhoto, then dispatch a new asynchronous thread to execute the executeRotateGimbal method. In the executeRotateGimbal method, reset Gimbal's position. It is necessary to reset the gimbal's position before rotating and shooting photos, otherwise the gimbal may reach the maximum angle of yaw axis when rotating 360 degrees. Use a for loop to shoot photo and rotate gimbal 45 degrees each time. When the for loop finished, we can show an alert view in the main thread to notify the user "Capture Photos finished". Build and run the app, and try the capture button function of the app without taking off the Inspire 1. You should see the gimbal of Inspire 1 rotating 360 degrees and shoot photos smoothly. It seems a bit inconvenient and odd to use sleep(2) between rotating the drone and shooting photos. Shouldn't there be an easier, more efficient way to implement this? Yes, the DJIMutableWaypointMission is designed for executing series of actions within different waypoints, which is perfect for our application! Here we create an uploadMissionProgressAlert to show the upload mission progress message. The "aircraftLocation", "aircraftAltitude", "gpsSignalLevel" and "aircraftYaw" properties will be updated as the latest flight controller system status of the drone. As the code shown above, we update the aircraftLocation, gpsSignalLevel, aircraftAltitude and aircraftYaw property values in the DJIFlightControllerDelegate method. In the code above, we create a DJIMutableWaypointMission object firstly and set its maxFlightSpeed and autoFlightSpeed properties. Then we use a for loop to create 16 DJIWaypointAction objects. Each step in the for loop, we create two DJIWaypointActions. Set the first waypoint action type as DJIWaypointActionTypeShootPhoto, the other waypoint action type as DJIWaypointActionTypeRotateAircraft with the appropriate rotate angles. Then add these two waypoint actions to the first DJIWaypoint. DJIWaypointMission requires at least two waypoints, and each waypoint must have different physical location, so we create another DJIWaypoint and control the drone to fly upwards 1 meter and take no action. Next, we add the two DJIWaypoint to the DJIWaypointMision object and set its finishAction type as DJIWaypointMissionFinishedNoAction. If we don't set the finishAction property, when the drone finish the waypoint mission, it will execute the go home command automatically instead of staying at the original position. Furthermore, we invoke the loadMission: method of DJIWaypointMissionOperator to load the waypoint mission into the operator. Lastly, invoke the addListenerToUploadEvent:withQueue:andBlock: and addListenerToFinished:withQueue:andBlock: methods of DJIWaypointMissionOperator to track the upload and finish events of the waypoint mission and show alert view to inform the user about the mission execution status and progress. In the completion block, we notify users the start mission result by showing an alertView. Build and run your code, take off the drone and fly to an appropriate altitude and press the capture button to execute the waypoint mission. You should see the drone start to rotate and shoot photos automatically. So far we have three methods to rotate the drone and shoot photos, we had better create an alert view to ask the user to choose which method to control your drone. Now the user can choose their preferred methods to take 360 degrees Panorama photos. In order to download multiple photos, you should go through a series of playback modes. Firstly, enter Playback mode, then enter Multiple Preview mode, furthermore enter Multiple Edit mode, lastly, select all the photos you just capture, and download them. Here we invoke the setMode:withCompletion: method to set the camera mode to DJICameraModePlayback . If it succeeded, we can invoke the selectPhotosForPlaybackMode method to select photos. 5. After you select all the photos, invoke the downloadPhotosForPlaybackMode method to download all the photos you need. In the DJIFileDownloadPreparingBlock, we initialize the "downloadedFileData" and dispatch a main thread to show alertView to user for notifying the current download progress. Then we append the "downloadedFileData" in the DJIFileDownloadingBlock and update the "downloadProgressAlert" message with the current process in the main thread. In the DJIFileDownloadCompletionBlock, we increase the "finishedFileCount" property value and save the downloaded photo image in the imageArray. in a local album in the DJIFileDownloadCompletionBlock. Finally, let's notify the users the download result by showing UIAlertView in the main thread in the overallCompletionBlock. Moreover, set the camera mode back to "DJICameraModeShootPhoto" after the photodownload finished. In order to download multiple photos using Media Download Mode, you should make good use of the DJIMediaManager and DJIFetchMediaTaskScheduler to refresh media file list and schedule the tasks. Firstly, enter Media Download mode, then refresh the media file list from the SD card, furthermore resume the DJIFetchMediaTaskScheduler, moreover, create multiple DJIFetchMediaTask for the photos to download, lastly, enqueue the tasks to the scheduler to execute and download photos. Here we firstly check if the DJICamera support media download mode, and invoke the `setMode:withCompletion:` method to set the camera mode to `DJICameraModeMediaDownload`. If it succeeded, we can invoke the `loadMediaListsForMediaDownloadMode` method to select photos. In the code above, we invoke the refreshFileListOfStorageLocation: method of DJIMediaManager to refresh the file list from the SD card. If there is no error, invoke the downloadPhotosForMediaDownloadMode method to download photos. Firstly, we initialize an NSMutableArray imageArray, which will be used to stored the downloaded images. And then invoke the sdCardFileListSnapshot method of DJIMediaManager to get the current DJIMediaFile file list, and store them in the files array object. After that, we check if the current media files' count is less than PHOTO_NUMBER, which is the photo count to create a panorama. If so, inform the user that not enough photos are taken using a UIAlertView and return. Moreover, we invoke the resumeWithCompletion: method to resume the DJIFetchMediaTaskScheduler and inform the user that resume file task scheduler failed using a UIAlertView. 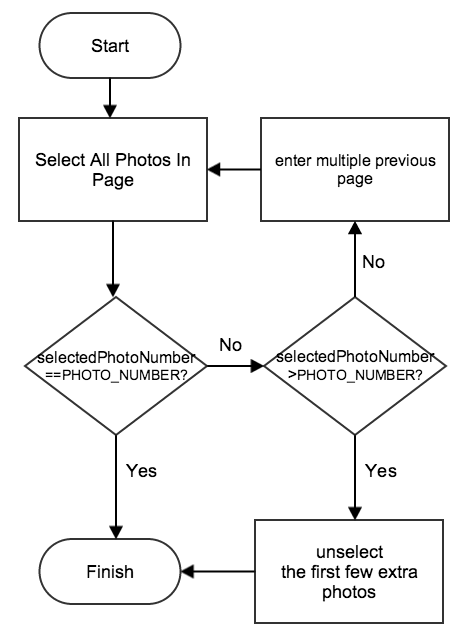 Lastly, we create a for loop and create 8(The value of PHOTO_NUMBER) DJIFetchMediaTask objects by invoking the taskWithFile:content:andCompletion: method of DJIFetchMediaTask class. Inside the completion block of the method, we firstly check if any error exists and show a UIAlertView to inform users. If not, access the preview property of DJIMediaFile to get the preview image for this media and add it to the imageArray array. Next, increase the value of finishedFileCount by 1 and show the media file download status message by using the downloadProgressAlert. If the value of finishedFileCount reach 8, we show a UIAlertView to inform the user that the download complete and set the camera mode back to DJICameraModeShootPhoto. Lastly, we invoke the moveTaskToEnd: method of DJIFetchMediaTaskScheduler to push the newly created task to the back of the queue for executing. Since we don't need the FPV view when stitching photos, we can create a new view controller called StitchingViewController to generate and present the panorama photo. 1. 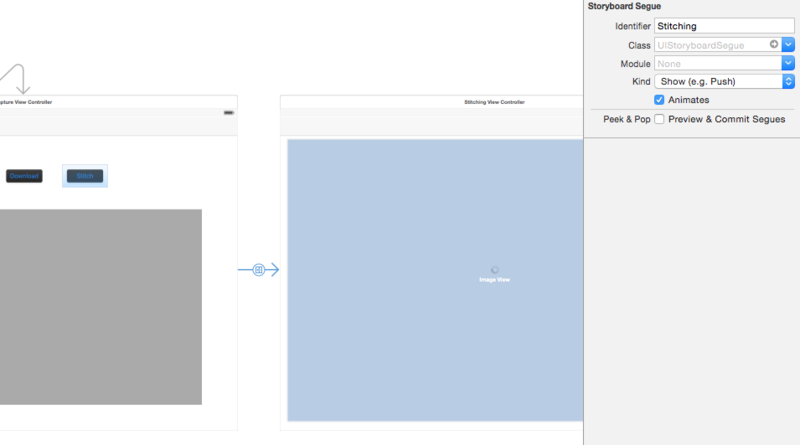 Embed the CaptureViewController in a navigation controller and add a new button called Stitch on it. 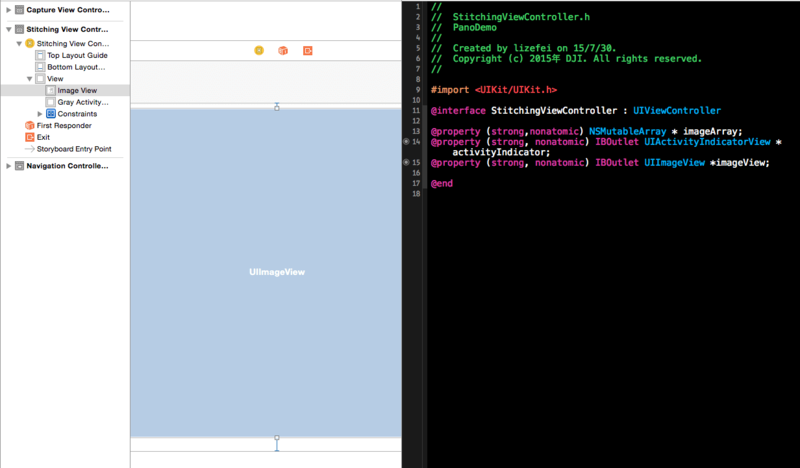 Then create a new view controller called StitchingViewController and add it in the Main.storyboard correspondingly. Then add a button named Stitch in the CaptureViewController and set its action segue to show the StitchingViewController. Set the segue's identifier to Stitching. 1. Build the opencv2.framework for iOS. You can check for more details in Installation OpenCV in iOS. If you have any difficulties compiling the source code, you can just download this project and copy the opencv2.framework. 2. Select the project target, go to Build Phases -> Link Binary With Libraries. Click the "+" button at the bottom and add theAssetsLibrary.framework library to your project. Click the "+" button, click on Add others and navigate to the directory where opencv2.framework is located and click open. 3. Add a PCH file into your project. Go to Build Setting -> Precompile Prefix Header, set its value YES, and set Prefix Header to be the location of the PCH file. 4. Build your project. If nothing wrong happens, you may successfully setup the OpenCV library in your Xcode project. 1. In the OpenCV, all the image processing operations are usually carried out on the Mat structure. However, on iOS, to render an image on screen it has to be an instance of the UIImage class. In order to convert an OpenCV Mat to an UIImage we can use the Core Graphics framework in iOS. Find more details, please check Convert UIImage to cv::Mat. You can define a OpenCVConversion class to deal with the conversion issue. 2. In order to call OpenCV functions in objective-C, you should create a header file and a C++ file as the stitching wrapper file. Input a vector of cv::Mat and the reference of cv::Mat. This function will tell whether the stitching is successful and return the stitched cv::Mat through a result reference. The code in StitchingWrapper.h is shown below. Because of the limited computing ability and memory storage of mobile devices, we don't suggest you to process full resolution images, because the stitching process may take a long time or cause run out of memory problem. We call the + (UIImage *)compressedToRatio:(UIImage *)img ratio:(float)ratio method to reduce the photo width and height by a ratio of HIGHT_COMPRESS_RATIO or LOW_COMPRESS_RATIO, which reduces the resolution dramatically(Like HIGHT_COMPRESS_RATIO2). If the image size is not small(The height is less than 1000), we use LOW_COMPRESS_RATIO, otherwise, use HIGHT_COMPRESS_RATIO. Then we convert the images to cv::Mat and push them into cv::vector. Finally, we can call the stitch function in the StitchingWrapper.cpp file to do the actual stitching work. 4. 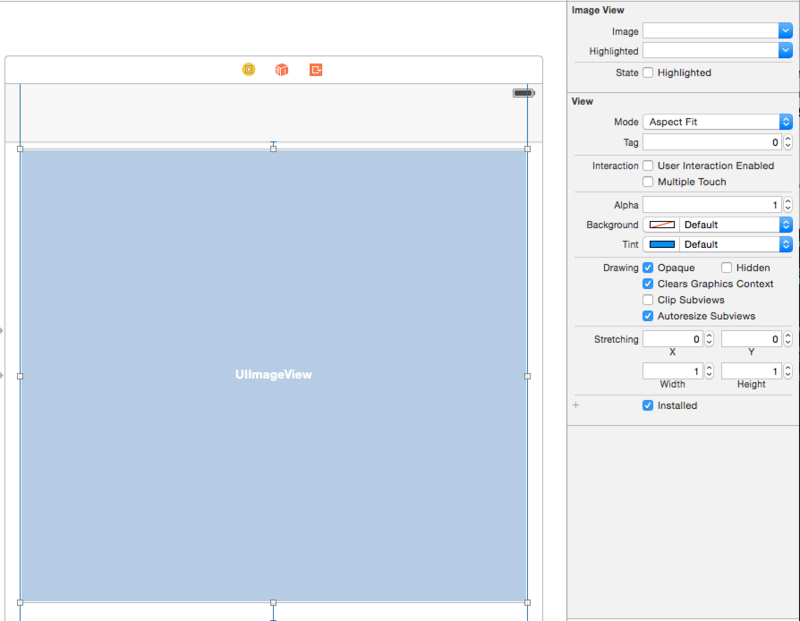 Now add an UIImageView in the Main.storyboard, set its Mode to Aspect Fit and create its outlet, called imageView in the "StitchingViewController.h" file. Now download the latest photos and click the Stitch button. After a minute you should be able to see an amazing panorama photo! So far, you have made an excellent panorama, but the uneven black edges are pretty annoying. Let's improve our code and make your panorama perfect! 1. Let's create a new class called Cropping to deal with the black edges problem. The bool checkBlackRow(const cv::Mat& roi, int y) function checks whether the number of black pixels in row y is more than CUTBLACKTHREASHOLD, while the bool checkBlackColumn(const cv::Mat& roi, int x) method checks the same for column x. These two functions indicate whether the row or column is part of a black edge that we don't need. + (bool) cropWithMat: (const cv::Mat &)src andResult: (cv::Mat &)dest converts the src cv::Mat to gray cv::Mat and initializes the roiRect to be the frame of src cv::Mat. Then it checks each of the four edges of the src Mat in roiRect. If an edge is black, it narrows the corresponding edge of roiRect and repeats checking and narrowing until none of the edges are black. Finally, it will copy the pixels in the roiRect of src to dest to complete the cropping process shown below. In this tutorial, you’ve learned how to use the Virtual Stick feature and the WaypointMission feature of Intelligent Navigation to control the aircraft to rotate and take photos. Also, you learn how to rotate the gimbal to take panorama photos too. Lastly, we used the OpenCV's features to stitch and crop photos into a cool panorama! Congratulations! Now that you've finished the demo project, you can use what you have learnt to start building your own panorama applications. You can improve the project by showing the aircraft's flight mode type, current GPS satellite count, vertical and horizontal flight speed and the flight altitude, etc. In order to make an amazing Panorama Application, you still have a long way to go! Good luck, and hope you enjoyed this tutorial!